This year promises some interesting additions to the Pelikan line-up if rumors are to be believed. We have already seen the Zeus and M101N Bright Red released along with the Ink of the Year, Smoky Quartz. News of Pelikan’s newest special edition broke today, courtesy of several vendors. Slated for a May 2017 release, the M800 family expands with the introduction of the Renaissance Brown. The Renaissance Brown will have a two-toned 18C-750 gold nib available in the standard sizes of EF, F, M, and B. Pre-release photos do not show a discrete ink window but the look of the material suggests there may be transparency in the barrel to allow for gauging the remaining ink level, similar to the Grand Place and Vibrant Blue. This is a special edition release which means quantities will be limited. A ballpoint pen will also be available. As far as pricing goes, I don’t have a lot of information yet from US vendors though we can extrapolate from past releases and expect that street pricing will be somewhere in the $600 neighborhood. Overseas vendors are currently listing this with Pelikan’s standard MSRP of €490 (~$520). Novelli is asking €402 (~$429) from those of us outside of the EU and not subject to the VAT tax. The ballpoint is similarly priced at €279 (~$298) for US customers. Unfortunately, those savings come at the cost of US warranty service. Overseas vendors such as Novelli and Niche Pens as well as The Nibsmith domestically are just a few of the vendors now accepting pre-orders. The initial photos that I saw of the Renaissance Brown did not impress me but these promotional photos certainly have promise and I can’t wait to see an example in person. I am surprised to see another brown colored M8xx pen so soon since the Grand Place was released just a year ago. I can’t help but think there will yet again be a fair number of Pelikan fans disappointed to see another new finish in the M8xx line, a pen considered to be too large for the comfort of many. For those folks, there is the hope of an M205 Smoky Quartz later this Summer and an M605 is reportedly in the works as well. What are your thoughts on the Renaissance Brown M800? It does seem that the M6xx gets little love. Hopefully the M6xx anticipated later this year will be to your liking. I tend to like brownish pens and like the looks of this new pen in the top photo (against the picture frame) but am not sure I really need another M8xx pen (have ~10 already). For the little that I write with any one pen, am not too concerned with loss of US warranty service (can you remind us about how long the pen is covered?). Sometimes I wish I’d focused more on the M6xx size because I like to carry my pens in my shirt pocket and find the M8xx sometimes hits the bottom of the pocket before the clip is fully engaged. But the M8xx does feel good in the hand. Have yet to order the Smokey Quartz ink… I should probably start with that… 😉 Appreciate your early warning, and the mention of Novelli, as I have a couple of other pens in the crosshairs. Do we really “need” any of them, lol. The current warranty on a new Pelikan pen is three years with a free nib exchange within the first 30 days of purchase. I have the same issue with the M8xx and shirt pockets. Some of my pockets accommodate them perfectly and others don’t. Maybe that’s how I should buy new shirts…take an M8xx to the store with me. I have no affiliation with Novelli but they are a reputable dealer that usually have pretty competitive prices for US customers. This looks stunning and would grace any desk or board room. I agree. To me it has a bit of a whimsical look but still retains a professional appearance. Hopefully real world photos will bare that out as well. Thank you Joshua. I think it is beautiful and intend to add it as soon as it ships. But then, I’m a fan of brown and black pens so this one fits right in… love the Grand Place but the darker overall color and more subdued highlights on this one really differentiate it from the GP and I won’t feel I’m duplicating at all. I had heard a 600 size was out there somewhere… M605, eh? Oh my. Would love a Stresemann to complete the set! You’re most welcome. My first thought was “not another brown pen” since the Grand Place was still fresh in my mind. That said, I think they revisited brown here and really set it apart from the Grand Place. I’m a fan and will be adding one myself. The M6xx that I’ve heard tell of is no Stresemann I’m afraid. I know! How about a M620 Boise, tastefully done in shades of sage and sand beige, with garnet highlights? From what I’ve heard, we haven’t seen something quite like this before. Looking to the fall. And how a about a SE M1000? Any finish would do! You’re welcome Luiz. I agree that it’s similar but I think that there is enough here to set it apart. EF, F, M, and B are about as boring as they come. Pelikan’s nibs are very predictable and lack any character which is a shame because I find them so dependable. I really wish they would bring some variety back to the table. No word on an SE M1000 that I’ve heard yet but I’ll post if I hear anything. I’m more excited having seen these pre-release photos. The leaked low quality photos had me less than impressed. That said, I am waiting for another release later this year that I think is even more stunning (a subjective assertion of course). Oof! Hardly fair! Can you at least give a hint? Is in the brown/beige colour family? Or something totally different to anything we’ve seen from Pelikan before? No browns or beiges but rather something with a bit of a different color palette from prior offerings. Do you have any intel on whether there are any other 8xx releases planned this year? Yes, I have heard talk of at least one and maybe two M8xx sized pens still to come. Looking to the fall. I was prompted by similar feelings which actuated Luiz, having dismissed the Renaissance Brown as too similar to the Grand Place. Upon further reflection (and the discovery of a 15% off promo code), I realised that I could purchase the Renaissance Brown for less than £300. I suspect that the price on the secondary market, should I ever decide to part with it, will not be dissimilar. Strangely, I was able to resist the Vibrant Blue last year without even a moment of weakness. 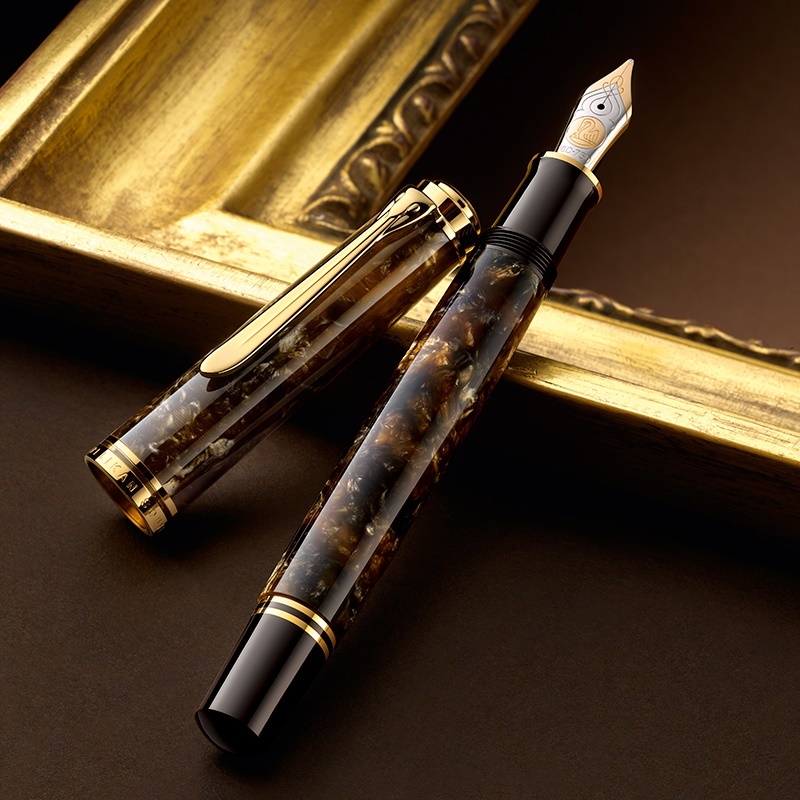 Now, if Pelikan were to make a ‘precious woods’ edition of the M800…but I mustn’t give them ideas! That’s a great price and would make any M8xx pen hard to pass up. Gray, who offers 15% off or Renaissance Brown for less than £300? Such deals often depend on your location. Those outside of the EU are able to realize more savings. Fritz Schimpf and Appelboom, for example, both sell the Renaissance brown for less than 300 GBP to US buyers. Appelboom’s price today is $506. However, Iguanasell’s price is $460. Appelboom was asking $416.08 for US customers excluding the VAT. They offer a 10% coupon making the final price $374.47 with free shipping. The $506 price includes a 21% tax that US customers can deduct. Iguanasell is indeed $460. Does Appelboom calculate all that, including coupon, automatically or does the buyer have to find and claim these deductions? When you place an item in the cart, it is at the VAT included price. When in your cart, you can apply the 10% “friend” coupon. When you checkout and change the address to the US, the VAT is deducted from the price and all orders over $200 have free shipping. Thanks Joshua! I finally figured it all out… searched Google for the 10% discount code, created an account, etc., but all well worth it. Is the “friend” code an ongoing thing or just for this pen? The code is an ongoing promotion. Not limited to just this one item. I find the Renaissance Brown finish quite attractive, and am tempted by nibsmith.com’s offer of a free custom grind with the pen. That gets around the problem of the boring standard nibs. I also have tons of wonderful brown inks that would suit it very nicely. I’m holding off now because I’m pursuing something much more rare on the Bay. Sounds intriguing. Good luck in your pen pursuits. That is a nice looking pen, brown is right up the for me, with green. But it is an 800 model and if I am going to spring for a pen that doesn’t really ring my bell I’m no going to pay 800 money. You mentioned the M600 line not appearing to get much love, my thought is that there are plenty of fixed costs associated with a new pen, and the variables are minimal between models. So perhaps the sales folks win the day with the logic that a new M600 model will only bring in $X, when a you could just as easily produce another M800 model and bring in $X+ per unit. Sorry if I seem cynical. To be honest, this one would tempt me if it were an M600; A little less money for a pen which fits my hand much better. I appreciate your cynicism and it certainly sounds plausible. Only Pelikan knows the true bottom line. Well, you also have to consider the fact that the M8xx nibs not only are considerably bigger but also made of 18K as opposed to 14K with the M6xx nibs. So Pelikan’s production costs are in fact higher for the M8xx line. I’ve always been curious to known just what the production cost are of each model pen but I’m sure that is a close company secret. The price for 18K (750) gold is about 25% higher than for 14K (585). Visually the M8xx nib seems to be at least 1.5 times bigger than the M8xx (rather a bit more). Replacement nibs are about twice the price (M8xx compared to M6xx). Which means about 220€ compared to 110€ (give or take some, depending on the seller – let it be 200 over 105). So: much of the higher cost (or rather most of the higher cost) comes from the nib. The Pelikan homepage lists the M600 Pink with 370€, the M800 Rennaisance Brown with 480€. The M600 Vibrant Green (no longer available) was listed with 385€. Therefore I think it is safe to say, that it’s not greed (in the sense of a higher profit – especially considering the fact that there WILL be fewer M8xx buyers than M6xx buyers if I take the postings here as a basis) that led to the decision for a M800 RB. And since you obviously had intel about an upcoming M605 my guess would be they needed a M800 special, that can and will be bought and used by more than just the most avid (and financially potent) collectors. Of course – since I have no connection to Pelikan whatsoever (other than loving their pens that is) I could be completely wrong. At the end of the day, we can only speculate but thanks for sharing your thoughts. I couldn’t resist and pre-ordered off Novelli. I thought I missed out on the Grand Place, admiring a brown Pelikan, and this looks just as great, if not better. I bought a Burnt Orange as my first M800, and this looks to become my third one in less than a year. I’m curious as to what they have in mind for this year’s later release. I hope it’s something not to my liking, as I definitely don’t need to add another to the flock, says my wallet. After gap of over 30+ yrs of using fountain pen, I recently decided to treat myself & narrowed down on Pelikan M800. I was pleasantly surprised that they’re coming out with a not-so-boring color option. The price of current M800 itself is a bit of a stretch for me. And I’m not willing to spend extra $ for Renaissance. Can anyone please share information about who has the best price & a discount code, if any? I live in the US. If you live in the US, your best price will come from overseas. There are many reputable vendors out there that offer different shipping options. You’ll have to shop around to find the one that might suit you best. La Couronne du Comte is offering 10% off using promo code KINGPELIKAN until 4/12 or so I’m told. If you miss that deal, LCDC also has regular 10% off codes. Appelboom gives a discount with the code FRIEND. Fritz-Schimpf doesn’t have discount codes but is usually very competitively priced. These are just a few and I have no affiliation with any of them. Check out the Links page to see a list of trusted vendors and shop around for the deal that best suits you. Good luck! Thanks. Just ordered from Appelboom with the FRIEND coupon code for a little over US$355. Great deal! Congrats and enjoy your new pen! I haven’t heard about anything reminiscent of the red striped M800. Definitely something less traditional coming from what I’ve heard. Does anyone have coupon/discount code for Cult Pens? For the regular M800, they have the lowest price $302. If the Renaissance Brown is also competitively priced, I’ll get it from them. No news on availability yet. Cult Pens does not often have coupon codes available though that isn’t to say never. There is nothing active at the present time that I’m aware of. Their prices for an M800, particularly for those of us outside of the EU, are great. Hope that you’re able to pick up a Renaissance Brown for yourself. just right and it writes like a dream. unfortunately this pen has not been made for years now and can only be found on the used market and they are still quite expensive. The M760 is a great pen. It’s the size of an M400 but just a touch lighter than an M800. They were made circa 1988-1995 and are great pens. You’re right that they are expensive but I find a lot of sellers over price these. With some patience and careful attention to the market, I have been able to buy them for $350-450 which seems reasonable for this model. Beautiful pen! I just had it in my hands (broad nib) and it took every fiber in my body not to buy it right away (I bought the LE Aurora 88 Sole just the week before). Beautiful nib. Very free flowing. Not as springy as my M400, but sure to provide a lot of writing satisfaction. Have decided to let my desire calm down for a bit. If it keeps lingering in my mind I may buy it anyway. Thanks for your insight. Still waiting to get one in my hand. Pelikan’s nib and feed are very well known for their generous ink flow. Enjoy the Aurora! The m800 that I received is with a plastic piston! Anybody have similar experience? I’m not sure what you’re seeing on your pen Adrian to lead you to that conclusion. My Renaissance Brown looks to be correct to me. There has been no design change that I am aware of. It is the piston housing that is brass. The piston rod and seal have always been plastic. The opaque material of the barrel makes it very hard to visualize. The pen should weigh approximately 29 grams. If you have a scale, you could weigh the pen for verification if you need further assurance. My M800 RB along with M805 Anthracite Stresemann arrived today. They’re my first Pelikans & for that matter, my first purchased fountain pen ever. The last FP I used was almost over 30 years ago, a Sheaffer with 18k Gold nib, that my Grandpa had gifted me. Anyways, I must say I’m a little disappointed! The pen does not have rich brown shades as in the picture above. It is duller version of brown & has more silvery, brown shiny speckles here & there. For that matter, I like the M805 Stresemann, which I bought it for my nephew, way better than the RB. Just thought of sharing my experience in case anyone is still on a fence. Thank you for sharing. For your fist fountain pen/Pelikan, you really jumped in there with the M800 line. Pre-release product photos are often a bit misleading. Thankfully, I usually find the pens actually look better in real life. My Renaissance Brown does have a richness to my eyes and I’m very satisfied with the look. There is inherent variation with every pen produced though so that may not be uniform. Your nephew is lucky be getting such a great pen. Also to add, the cap appears much lighter, transparent material then the pen. However, when capped or closed, it matches the rest of the pen. Adrian, I do not know how to open the pen so cannot comment on the piston. In my experience, I do not notice difference in the weight of M800 & M805. The cap is lighter when removed from the pen because the material is thinner/more translucent. Mine arrived on the 3rd and I must say I am completely satisfied with this edition. Such a rich look in person and so interesting in different light, I think Pelikan did a great job and I’m glad I jumped on this one. I loaded it with Smoky Quartz and it looks like they were made for each other, and on decent paper the B nib on mine puts down a perfect, shady line. Very pleased! Glad to hear that you like it. I’m equally pleased with mine. I can’t wait for the M805 later this year. this new edition is stunning. Hi folks: Just wondering how this compares to the old Pelikan San Francisco which is a bit more of a tortoise look. I think this pen is actually quite stunning although I wonder about consistency in terms of the colors/level of bright and dark. Hi Mark. The Renaissance is much more vibrant appearing than the San Francisco. It is a stunning pen to behold and is overall fairly bright. The finish does indeed seem consistent but each pen has variation so no two are alike. I highly recommend the looks of the Renaissance. Pictures just don’t do it justice. Congrats on the new pen! I have the same combo in rotation right now and am enjoying it tremendously. Enjoy.